The United States Congress designated the Chama River Canyon Wilderness (map) in 1978 and it now has a total of 47,035 acres. All of this wilderness is located in New Mexico and is managed by the Forest Service. 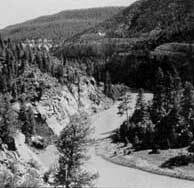 The Wild and Scenic Chama River, popular among river rafters and canoeists, runs through six miles of the Wilderness. Its beauty is so impressive that most people don't bother visiting the relatively unspectacular grassland that dominates the upland portion of the area. Trail access is poor here above the colorful sandstone bluffs and lovely rock formations that rise to high rims on both riverbanks. Water levels reflect releases from the upstream El Vado Lake Dam, but you can usually float the river, with portages, all the way from the Colorado border to the Rio Grande through the rainbow-hued Chama River Canyon. Backpackers can hike along portions of the Chama River, then pitch their tents in a secluded wooded campsite above one of the canyon's high-water beaches. Trout often flourish in the river (so bring your gear), and onshore residents include mule deer, black bears, elk, coyotes, and mountain lions. Varying canyon elevations also provide a wide range of vegetation, from low-lying pinion-juniper woodland to ponderosa pine and fir. Most of the Wilderness lies in Santa Fe National Forest, with a portion in Carson National Forest. Planning to Visit the Chama River Canyon Wilderness? How to follow the seven standard Leave No Trace principles differs in different parts of the country (desert vs. Rocky Mountains). Click on any of the principles listed below to learn more about how they apply in the Chama River Canyon Wilderness.